The Evolution dehumidifier from Dri-Eaz is designed to be a compact and highly portable design; it also is intended for controlling moisture in enclosed environments such as telecommunications control rooms and basements, drying carpets after cleaning, and minimizing moisture issues during construction or remodeling projects. 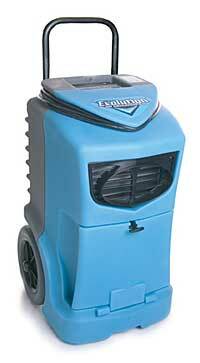 The unit uses low-grain refrigerant technology to keep removing ambient moisture as the air gets drier. The machine draws 5.6 amps and uses a rotomolded housing that resists rust and dents.